Doris Kearns Goodwin provided all Civil War lovers with a wonderful book entitled Team of Rivals: The Political Genius of Abraham Lincoln. As the title implies, Lincoln’s cabinet consisted of men who were running for president or were political rivals to Lincoln leading up to the 1860 presidential election. I just learned that this book will become a movie (directed by Spielberg himself!). As a pastor and preacher, I am always interested in how leaders communicate. For us, it’s always a work in progress. In reading this work, Goodwin relays the account of the beginnings of Lincoln’s rivalry with Stephen Douglas. At the time, the issue of slavery was bringing the Union to a tipping point. Western expansion of the United States brought the issue of whether to allow slavery into these new areas. The newly passed Kansas-Nebraska Act (1854) repealed the Missouri Compromise of 1820 and allowed those new territories to decide for themselves if they would be slave or free—a doctrine known as popular sovereignty. Stephen Douglas was the main proponent of this doctrine. At the time, Lincoln was merely against westward expansion of slavery—a view that would increasing evolve into one who believed in emancipation. Nevertheless, Lincoln, a young newcomer to Illinois political scene stood toe-to-toe with the veteran Douglas at the Illinois State Fair in 1854, soon after the passing of the Kansas-Nebraska Act. In just a few short pages, Goodwin paints the picture of Lincoln’s communication skills, giving lessons to all of us who communicate. Preparation: “Before speaking out against the Nebraska Act, Lincoln spent many hours in the State Library, studying present and past congressional debates so that he could reach back into the stream of American history and tell a clear, reasoned, and compelling tale. He would express no opinion on anything, Herndon observed, until he knew his subject ‘inside and outside, upside and downside.’ Lincoln told Joshua Seed, ‘I am slow to learn and slow to forget that which I have learned. My mind is like a piece of steel, very hard to scratch any thing on it and almost impossible after you get it there to rub it out” (164). Conviction: “’He began in a slow and hesitating manner,’ Horace White noted. Yet minutes into his speech, ‘it was evident that he had mastered his subject, that he knew what he was going to say, and that he knew he was right’” (165). Connection to their history. “While Douglas simply asserted his points as self-evident, Lincoln embedded his argument in a narrative history, transporting his listeners back to their roots as a people, to the founding of the nation—a story that still retained its power to arouse strong emotion and thoughtful attention” (165). “In order to make his argument, Lincoln decided to begin with nothing less that an account of our common history, the powerful narrative of how slavery grew with our country, how its growth and expansion had been carefully contained by the founding fathers, and how on this fall night in 1854 the great story they were being told—the story of the Union—had come to such an impasse that the exemplary meaning, indeed, the continued existence of the story hung in the balance” (166). Clarity. “Many of his arguments were familiar to those who had followed the Senate debate and had read Chase’s ‘Appeal’; but the structure of the speech was so ‘clear and logical,’ the Illinois Daily Journal observed, the arrangement of the facts so ‘methodical,’ that the overall effect was strikingly original and ‘most effective’ (165). Ordinary language. “Instead of the ornate language so familiar to men like Webster, Lincoln used irony and humor, laced with workaday, homespun images to build an eloquent tower of logic. The proslavery argument that a vote for the Wilmot Proviso threatened the stability of the entire Union was reduced to absurdity by analogy—’because I may have refused to build an addition to my house, I thereby have decided to destroy the existing house!’ Such flashes of figurative language were always available to Lincoln to drive home a point, gracefully educating while entertaining—in a word, communicating an enormously complicated issue with wit, simplicity, and a massive power of moral persuasion” (166). The Confederate States of America has long held an interest for this ‘son of Virginia,’ ever since my second-grade teacher took us on a field trip to Appomattox. It’s infused in every Virginian the history of his native state. William C. Davis’ book on the last four months of the Confederacy is a marvelous book in giving the grim realities of how ‘the Cause’ flickered out. Now living in Kentucky, this book offered me my first glimpse at John C. Breckinridge. Against secession and against the notion of taking up arms against the Union, he did so nonetheless in defense of the South. He served as the only one who would stand up to Jefferson Davis’ stubbornness with some modicum of (as a previous reviewer noted) statesmanship. He knew when the Confederacy was over, unlike Davis who was willing to continue the cause in Texas, and he helped more than anyone in the South (along with Lee) to make sure the South wasn’t completely crushed in the aftermath of Lincoln’s death. This book was meticulously researched–and imminently readable! I couldn’t put it down–especially at the part when Davis was captured by Yankee soldiers in Irwinville, GA, and how Breckinridge and Judah P. Benjamin escaped through Florida, survived over open water to Cuba, then the Bahamas. Benjamin went to England, Breckinridge returned to the North American continent, stayed with expatriate Confederates in Toronto until Andrew Johnson’ Universal Amnesty allowed him to return to his beloved Kentucky. Unlike Davis, Breckinridge did not continue the vitriol in who was to blame (unlike Davis), but remained quite, save a brief eulogy in 1870 for the death of Robert E. Lee. Breckinridge was a noble man caught up in a bad cause. It’s because of him that the Confederacy contains any nobility at all. For some of you, that may not be a ringing endorsement for the man. But this book will help you see the warts and wrinkles of it all–and show that not everyone caught up in that cause was inherently evil. This book is worth your time. For a more extended (and much better) review, check out Ryan McMaken’s review. James I. Robertson, Jr, history professor at Virginia Tech in Blacksburg, VA, has an interesting lecture (yes, it’s an interesting history lecture) on how the Civil War still impacts our lives in ways that we often take for granted. Originally aired on the Research Channel, this lasts almost 26 minutes, but it’s well worth your time. Enjoy! Mark Noll’s wonderful book The Civil War as a Theological Crisis has a rather disturbing beginning. It’s only disturbing to those who hold to the inerrancy and sufficiency of the Bible. In the antebellum era of the United States, representation of Protestant Christianity was very strong. Yes, it was found in various forms: Baptist, Methodist, Presbyterian, Congregationalism, etc., but by and large they sought to be led in faith and practice by the Word of God. Henry Ward Beecher, the most renowned preacher in the North, and pastor of the Plymouth Congregational Church in Brooklyn, NY, preached that slavery was “the most alarming and most fertile cause of national sin.” The Bible was clear that no government could thrive for any length of time if slavery were legal. James Henley Thornwell believed differently. . . from the Word of God. Slavery was “good and merciful” and that the Scriptures did not go against the institution of slavery. Slavery must not be done maliciously but from principle. Noll notes that Thornwell was “so confident that, like Beecher, he did not engage in any actual biblical exegesis” (2). Henry Van Dyke at the First Presbyterian Church in Brooklyn believed that the true evil was in the heart and activity of the abolitionists. The “tree of Abolitionism is evil, and only evil—root and branch, flower and leaf, and fruit; that it springs from, and is nourished by, an utter rejection of Scripture.” Van Dyke believed men like Beecher were going against the Scripture’s authority. Lastly, Tayler Lewis, a Dutch Reformed layman who, since 1838, was a professor of Greek and oriental studies at NYU then at Union College in New York, believed that since the New Testament said nothing about buying and selling slaves, and since this was key to the American slave system, then the New Testament did not permit this system. What is a person to think about all this? If the Bible is a unity without any mistakes, as the Word says and so many believe, how could so many clergy come to such different conclusions? We forget how much our culture influences and filters our thinking. But should we try to fit in the Bible with our “story” or should we fit in to the grand redemptive theme and “story” of the Scriptures? For many (maybe myself included) this would be a strange transition. I have just finished reading Clement Eaton’s 1979 biography, simply titled Jefferson Davis. Eaton gave a balanced understanding of one whom historian Joseph Ellis calls “the sphinx of the confederacy.” Biographies of Davis are hard to come by, but I was blessed to find one at a discount book store here in Lexington. 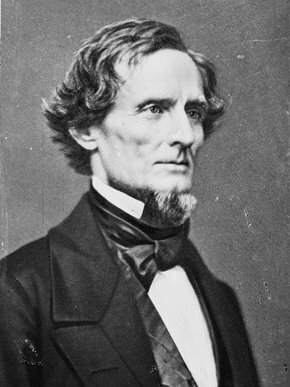 Jefferson Davis was the epitome of a Southern statesmen, solely focus on Southern rights and interests during his three terms as senator of Mississippi in the 1850s as well as serving in President Franklin Pierce‘s cabinet as Secretary of War (1853-1857). Davis adamantly opposed a strong central government in favor of states’ rights, and in turn believed the Constitution permitted slavery by those Southern states. He (along with Abraham Lincoln and the North) believed that blacks were inferior, and thus slavery was good for them. He, like many others (even Christians), believed the institution of slavery good for blacks because it rescued them from the pagan religions of Africa. One can argue the constitutionality of slavery (legally, it was very much protected by the United States Constitution, though abolished by the 13th Amendment on December 6, 1865), but one would question the morality of it all. Why? Because every human being on the planet is an image-bearer of God (Genesis 1:26-27). All are sons of Adam (Romans 5:12-14) who were split up at the Tower of Babel (Genesis 11). Jesus came to undo the curse of Adam (Romans 5:19-21) and to call out His elect from every tribe, tongue, people, and nation (Revelation 5:9-10). There is no distinction between nationalities, races, or even gender in regards to salvation (Galatians 3:28-29)–although there are differences in the roles among the genders (Ephesians 5:21-33; 1 Timothy 2:9-10). These man-made barriers we erect in order to enhance our superiority over others are abolished by the cross of Christ (Ephesians 2:11-22). By Davis expecting God to be pleased with the enslavement of one of his prized creation (humanity), and justifying this enslavement by saying he removed them from a worse situation to a better one is a sad indictment on this aspect of the Confederacy’s modus operandi. Just because one person determines what situation is better than another does not make it so. Yes, the Christian faith was imparted to the slaves. One of my friends noted that the American Indians (he is a Chippewa) encountered Christianity through the Europeans coming to North America and Manifest Destiny once they arrived (although he wasn’t crazy about how the latter played out historically). Yet, the circumstances that precipitated this conversion made many associate Christianity with white oppression. So argue what you will about the legal merits of slavery–can one argue with the moral and spiritual ramifications that ensued? The point of this blog is not to debate the finer points, but to see how administrations past and present use biblical language to push forward their agenda. What about this? From George Washington to our current president, this has been a common practice. What do you think about Obama’s use of this rhetoric? Moe Bergeron publishes through Christway Media D.A. Carson’s devotional, “The Love of God” via e-mail (with Dr. Carson’s permission) that gives devotionals based on the McCheyne Bible Reading Plan. Given my enormous love for the gospel and (at a distant second) American History, I found myself attracted to his devotional today. AT THE BEGINNING OF THE AMERICAN EXPERIMENT in democracy, the Founding Fathers adopted several stances, accepted by few today, that were deeply indebted to the JudeoChristian heritage. This is not to say that the Founding Fathers were all Christians. Many weren’t; they were vague deists. But among these biblical assumptions was the belief that human beings are not naturally good and have potential for enormous evil. For that reason, when the Fathers constructed their political system, they never appealed to “the wisdom of the American people” or similar slogans common today. Frankly, they were a little nervous about giving too much power to the masses. That is why there was no direct election of the president: there was an intervening “college.” Only (white) men with a stake in the country could vote. Even then, the branches of government were to be limited by a system of checks and balances, because for the Fathers, populist demagoguery was as frightening as absolute monarchy (as we saw in another connection on January 20). Not for a moment should we depreciate the relative good of living in a country with a relatively high level of income, a stable government, and some accountability. But such blessings do not guarantee righteousness. “The LORD reigns forever; he has established his throne for judgment. He will judge the world in righteousness; he will govern the peoples with justice” (Ps. 9:78). Hear the voice of Scripture: “Arise, O LORD, let not man triumph; let the nations be judged in your presence. Strike them with terror, O LORD; let the nations know they are but men” (Ps. 9:19-20). First of all, I must say how grateful I am to Southern Seminary for (1) having a marvelous conference (Southern Seminary and the History of American Christianity, on February 18-19, 2009), and (2) providing two free books to all conference attendees. 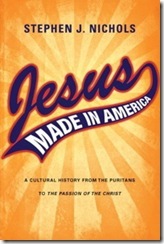 One of the books I chose is “Jesus Made in America: A Cultural History from the Puritans to The Passion of the Christ” by Stephen Nichols. I bought this book for two reasons. First, because of Nichols’ engaging style at the conference. And, on a personal note, I had a chance to speak briefly with him in the Legacy Center lobby that night. He was just as engaging in a personal conversation as he was delivering his lecture on the influence of D.L. Moody. And his engaging style transfers to the written page, making this clearly my favorite read of the year. Chapter One (The Puritan Christ): The Puritans saw Jesus clearly as the "God-man," but many in evangelicalism today wonder whether recovering their mindset is worth the time. To many today, "He is a bit too far out of reach for personal touch." Yet, for all their flaws, the Puritans offer a balance between the transcendent and imminent Christ. Chapter Two (Jesus and the New Republic): When our country was formed with the writing of the Declaration of Independence (1776) and the ratifying of the Constitution (1789), many of our most influential founding fathers began to reject the Puritan look as a those of us who are "sinners in the hands of an angry God." Men like Thomas Jefferson rejected the miracles of the Scriptures, only choosing to extract the moral teachings of Jesus. Thomas Paine, author of Common Sense went further to decry religion altogether. Yet, Americans then (and now) thanks to numerous writings and paintings, were quick to paint George Washington as a Messianic figure, even though he gave scant references to God. The Jesus of the New Republic was portrayed as one who desired moral character and virtue, but little use was made for any condemning and judging role Christ played. Chapter Three (Gentle Jesus, Meek and Mild): Andrew Jackson’s frontiersman celebrity helped craft Jesus into a man’s man, with little use for the creeds and much use for . On the other end of the spectrum, the Victorian Jesus was one who was gentle, respectful, friend of children, and almost effeminate. Many depictions of Jesus were that of one with long hair, blue eyes, smooth skin, and womanly features. Chapter Four (Jesus, Hero for the Modern World): In this chapter, Nichols discusses the theological debates between liberal scholar Harry Emerson Fosdick and conservative scholar J. Gresham Machen. For Fosdick, Jesus was all about peace and brotherhood, playing off the philosophy of Henry Van Dyke. Machen sought to bring the church back to orthodox Christianity. Chapter Five (Jesus on Vinyl): From the Jesus People Movement to the mega-corporate Christian Contemporary Music (CCM) scene, adapting Jesus and his ways to the airwaves and drained even more of the deity out of Christ. Now, Nichols contends, we are relegated to singing "love songs" to Jesus. Crossover bands recognize that if they desire airplay on a wider realm, they must refrain from using, as DeGarmo and Key slyly remarked, "the J-Word." Chapter Six (Jesus on the Big Screen): From DeMille’s King of Kings in 1927 to The Passion of the Christ in 2004 (with a stopover at Scorsece’s The Last Temptation of Christ, Nichols gives an interesting overview of Christ on film. He rightly notes that most of these films fill in some of the spots missing (such as Jesus’ childhood) and gloss over areas where the Scripture does speak. A case in point is Gibson’s Passion, which draws more on his Catholic tradition than it does on the sole authority of Scripture. Nichols gives a helpful survey to help us be more discerning. Chapter Seven (Jesus on a Bracelet): from the WWJD? bracelets to Precious Moments, Nichols gives a very disturbing view on how Christ is merchandised. You just need to read this chapter to get an idea of how absorbed we are in this mindset. Chapter Eight (Jesus on the Right Wing): From Jimmy Carter’s claim to being "born again" to George W. Bush’s claim in the 2000 Republican Presidential Primaries that Jesus influenced his thoughts the most, Nichols examines how both the right wing and the left seek to lay claim to Jesus as an advocate to their causes.